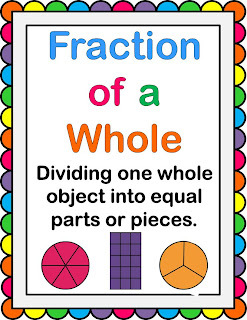 If you read my post on Friday then you know that we started our Fractions unit and that it took a lot of prompting and some ridiculous drawing on my part to remind my students that FRACTIONS NEED EQUAL PARTS. So to save my sanity I made up a couple of posters that I will post and point to whenever I need to (hopefully not too often). 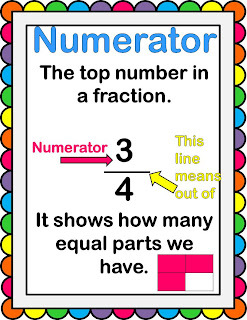 I made one for numerator and denominator too, since I inevitably explain those over and over and over too. Be sure to head over to Classroom Freebies for more Manic Monday freebies. Awesome! Thanks! This is going up in my room today! Thanks for the cute posters. Our Third grade Math Wizards completed fractions last month but I am using the last six weeks of school to review money, multiplication, elapsed time, and fractions. These will be a big help! Thank you, my friend! These will come in super handy and they are so fun looking and colorful!! Love them!